"We chose Castello Praja as the place we would pledge our eternal love. What a choice we made!! In the dictionary under the word picturesque, it says, see Castello Praja. The castle was not only exquisite, but the castle's family literally treated us like royalty. From the moment we arrived at Castello Praja, we were waited on hand and foot, fed extraordinary cuisine, and treated to guided tours of the spectacular region in Praia a Mare and the surrounding villages. We simply cannot say enough wonderful things about the family of Castello Praja and the property itself. We were in heaven during our week stay at the castle and Kiyomi's parents can now brag about their stint as the Lord and Lady of Castello Praja. Our wedding, on the turrets of Castello Praja overlooking the Mediterranean Sea on a perfect spring afternoon, is something that not only Kiyomi and I will talk about for the rest of our lives, but our guests will as well. Our goal was an intimate wedding adventure, and we succeeded with a quaint wedding ceremony in Italian and English translation, fabulous sights, adventurous photographers and guests, and incredible food to keep our stomachs' happy. The photographers, took us around the town and port of Maratea and produced a fabulous album and DVD. We are incredibly thankful to them for their hard work and creativity. The entire experience at Castello Praja was fabulous. Everyone left the castle with memories that will be forever etched in their minds and hearts. And Kiyomi and I have a sneaky suspicion that we will be back someday to renew our memories. Castello Praja is just that beautiful and special." 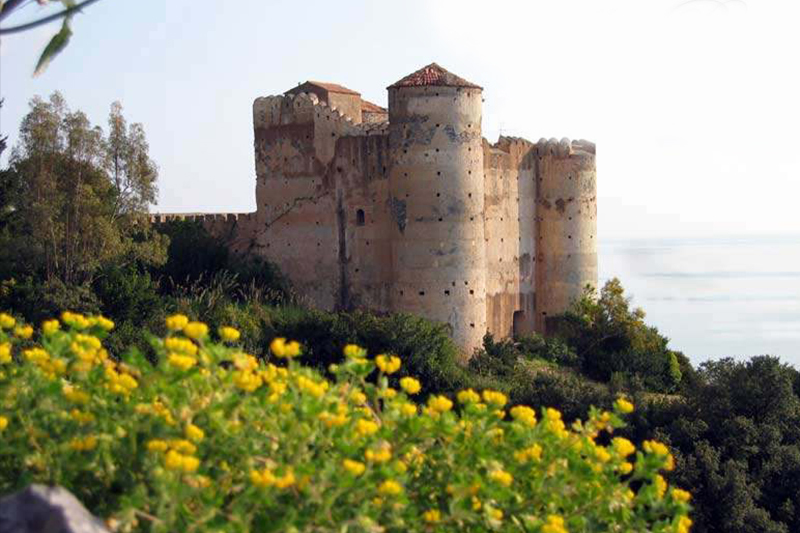 "Castello Praja" is a 13th century castle of magnificent defensive military architecture. It amazingly retains its original character. The castle had two major military roles. First, as was common in medieval Italy, it was used as a base in the feud between two local families. The triumphant family of that feud, the Marchesi family, still owns and periodically uses the castle today. Second, the castle supported the Christian alliance of the Byzantines and the Longobards in their successful struggles against the Saracens - helping to save European Christianity. Although in years of old the function of Castello Praja was military, today it is simply romance. Perched on a rock overlooking the sea, the mountains and the town of Praia a Mare, the awesome warrior might of the castle walls are mellowed by acres of gardens and trees. Situated amidst this verdant softness and rays of yellow sunlight waits a small simple wedding chapel - it waits to bestow its ancient blessings on couples beginning new lives, beginning new chapters, beginning new histories. Epic history, stunning medieval castle architecture, and 360 degree panoramic views aside. They offer cooking lessons and pasta and Pizza making demonstrations. The castle with its public rooms and courtyards has 8 bedrooms (one single) and seven bathrooms.